As I have mentioned previous, the Dmax has the most "tray/load area" in front of the rear axle out of all vehicles in this class according to IUA in their advertising blurb, hence minimising aft axle overhang. Surely this mitigates risk to a degree of cracking/bending chassis, even if Joe Novice was at the wheel with a poorly loaded truck. It's not a fail safe, but I reckon it goes someway towards the Dmax holding up compared to others, especially as we are battling to find any instances of this occurring. There are many members here coming up to 100k km in current models, who have been out there using their trucks with no issues. Yes mydmax all the gear you need for self sufficient camping. Once you have tools and spares recovery gear 6 Jerry cans you know all the usual suspects it adds up. Now I will be towing a trailer with 400 of that in it. I doubt that it is the load within the tray as this virtually sits directly over the axle. Loading a camper/trailer with heavy ball weight is the likely culprit considering the chassis is bent upwards at the cab/tray region. Ball weight can apply a massive force through leverage of the A frame onto the tow ball. This would be why some cars have a reduced tow capacity for off road. I know that towing our van with 300-350kg on the ball, it is the undulations that really worry me. like jerry cans, spare tyre, fridge in front of the rear axle if possible. 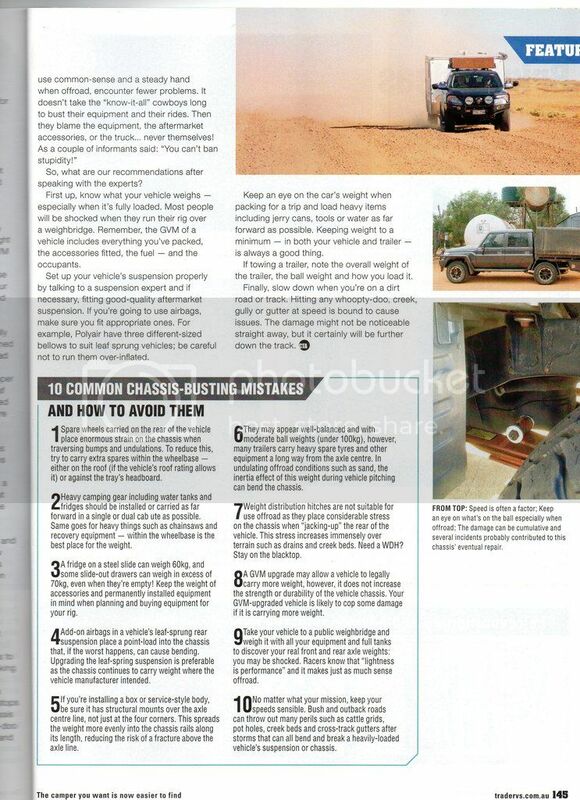 Here is the page from the article with the 10 tips. Some are just common sense and of course you should load the heaviest stuff against the back of the cab. Overloading and towing trailers is the main problem when hitting dips too fast. As the rear of the vehicle accelerates up and down the weight of the trailer increases the load stress when whole lot reaches the bottom of the cycle. Trailers loaded with too much ball weight multiply the problem. Then we go and add all the camping gear , I wasn't going the bother with a longrange fuel tank with this vehicle , just chuck a couple of jerry cans in the tray when needed . I'm now having a rethink a bigger tank bolted to the chassis , is probably a better idea , keeps the weight down low . We have only ever had one 39lt Engel , 24years and still going , it's in the Cab behind the passenger seat , only use plastic boxes for most things . A lot now have 2 fridges on slides , I thought about buying a fridge slide a few years ago , I picked one up at a show , bloody thing was that heavy , I soon changed my mind , I asked about a set drawers for one of my vehicles , when they told me the weight , nup don't want em . When we decided not to have a slide or drawers , we didn't need a canopy either , our cooking gear , one fry pan one saucepan and steamer a kettle and a single gas ring , the ute tail board was our table . When I think about all the stuff we don't have and my Hilux was still way over GVM , bloody hell how much over are most others . I have 4 med space cases 1is the pantry 1for the cooking gear 1 for tools and spares and 1 for general camping pegs tarps extra blanket and stuff. Jerry cans ,table , 2 chairs, gazebo, rtt and a few other odds and ends. Frigdes and batteries everything has a purpose or is insurance and that adds up to about 700 kgs. All I have to do is get the car weighed I think I might need to loose a couple of kilos. Well I weighed my ute today empty with full fuel tank and 2 adults. The result is what I expected, the ute came in at 2400 neat. That leaves me with 550 for camping gear. With these figures its no wonder Utes are overloaded out on the tracks.